"We at BEAN'S BOATS go to great lengths to produce a top quality product. Our nautical boat furniture is made out of hand picked cedar, the shelves are solid cedar, and the sides are grooved cedar panels. The gunnels and trim are all cedar as well. The Boat Bookcase Shelf have matching color oarlocks. Our Canoe Shelves have leather, laced up the gunnels, giving them a wonderful outdoor look. Our Lamp/End Table, End Table, Canoe, Boat Coffee Table, and Canoe Sofa Table, all come with removable glass tops. This makes a great place to display all your collectibles. We make to styles of End Tables one with real paddles for legs and a solid cedar shelf underneath, and the other with log legs and a slated bottom cedar shelf. For an added touch the Boat Coffee Table sits on a little Boat trailer with wood wheels. Where as the Canoe and Sofa Table have log legs with paddle side braces and two paddles for a bottom shelf. Decorate the inside of these boats with our accessory package or add your favorite collection, whether it be a collage of pictures, shells, antique fishing items, or let your imagination and creative touch be a reflection of your home. All these pieces have a hand rubbed in finish which brings out the beauty of the wood. The Gun Cabinet and Entertainment Center have a hard poly satin finish to add to the durability and gives these pieces a very rich look. All our pieces are Brass Tagged with the Bean's Boats logo. Custom lettering can be added for the personal touch to a side of any boat piece. We pride ourselves in making a quality piece of furniture that is functional, durable and fun. And will last you a life time. Garden Anything is IN!!! Our Garden Cabinets are made from quality pine. They come in distressed white, granny's green or Country Blue, all in a worn look. Our Picket Fence Cabinet comes with adorable Water Faucet Handles with either a spindle or tulip decoration. The Screen Door Cabinet comes as a square or corner piece. The top has two open shelves with a fake door handle and the bottom has two shelves with a spindle door . TOO CUTE!!! We at Bean's Boats look forward to working with you and welcome custom work. We are constantly coming up with new furniture designs and have had many ideas come from our customers. Be sure to catch the wave as we continue to bring you new and exciting furniture pieces. Since all our Furniture Items are individually Handmade, shipping times vary. Give us a call today, we'd love to help you decorate that new log home, cabin, lodge, office, camp or home away from home. 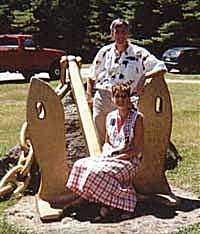 Bean's Boats is a small manufacturing company in the great northern forest of Wisconsin. Bean made his first boat shelf as a display unit for fishing items that I sold in my retail shop. That was the beginning! He started making and selling the shelves to surrounding furniture stores. He did that for 6 years in his spare time. Each piece is brass tagged with the Bean's Boats logo on it. We pride ourselves in making a quality piece of FURNITURE that will last for generations.